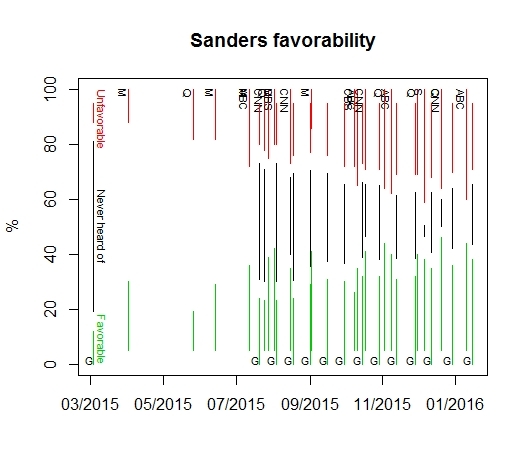 The chart below shows the growth of Sanders’s name recognition (as well as favorability and unfavorability ratings) over the period March 2015 to January 2016, a period which roughly corresponds to the time between Sanders announcing his candidacy for president and the first primary votes. The data indicates that when Sanders entered the race 60% of the population never heard of him and only about 20% had some sort of an opinion about him. Even in January 2016, about 20% of respondents said they never heard of Sanders. This can be instructively compared with candidate Obama’s name recognition history, who was unknown to only 15% in March 2007, and was known to all but 3% by January 2008. 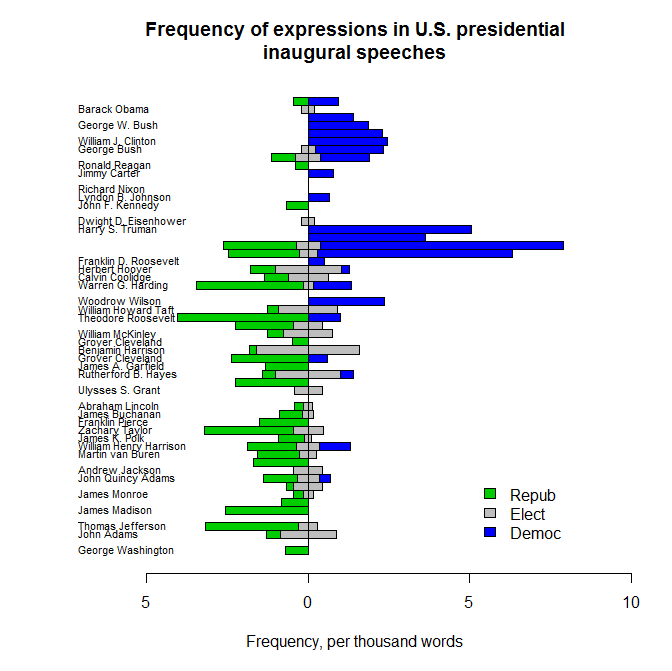 The figure below shows the frequency of certain types of words in inaugural speeches of U.S. presidents. The three types showed are words beginning with the string “elect”, words beginning with “repub” and words beginning with “democ”. Around the middle of the 20th century the “elect” and “repub” types were largely abandoned while the “democ” type became more prominent. The Data was extracted from the texts of the speeches as found on the website of the “UCSB presidency project” using an R script. Note: The data here do not include settlers and construction in the eastern neighborhoods of Jerusalem, i.e., those areas of the West Bank that are included by Israel in the municipal boundaries of Jerusalem. 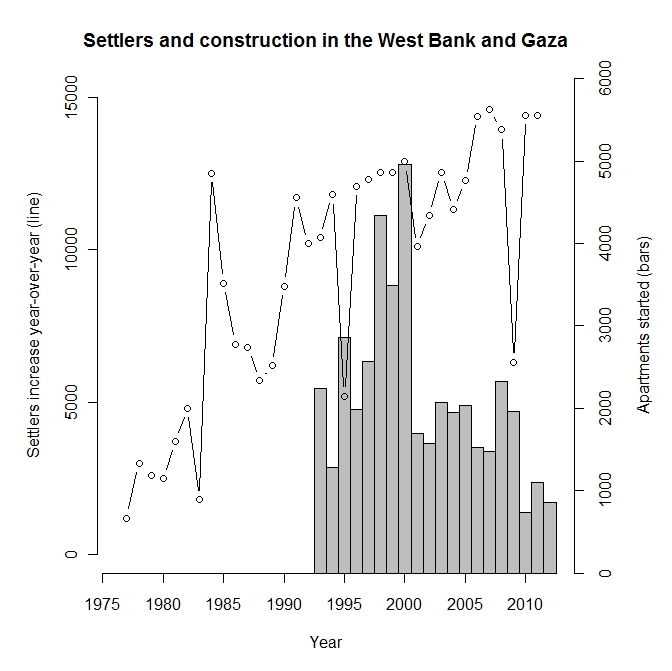 Data sources: Statistical abstract of Israel, various years; B’tselem report, By Hook or By Crook. Table 1 (based on Statistical abstract of Israel, various years). Data: 1, 2. The increase of the Haredi (Jewish ultra-orthodox) population in Israel is a topic widely discussed in Israeli mass media and with considerable sway over Israeli politics both in the form of increasing Haredi electoral power and in the form of providing campaign and policy agendas for opposing forces. Official statistics (social security annual report 2011, charts on pages 139, 140) indicate that the average Haredi family has about 6 children (with a decreasing trend over the last two decades) while non-Haredi Jewish families have about 2.5 children. Talk about demographic trends caused by the differential fertility rate, causing an imminent “Haredi and Arabic” majority, is quite common. This is coupled with complaints about the fact that Haredi labor force participation rate is low, the fact that Haredim do not serve in the Israeli military and the fact that some Haredim receive stipends from the state as rabbinical students. 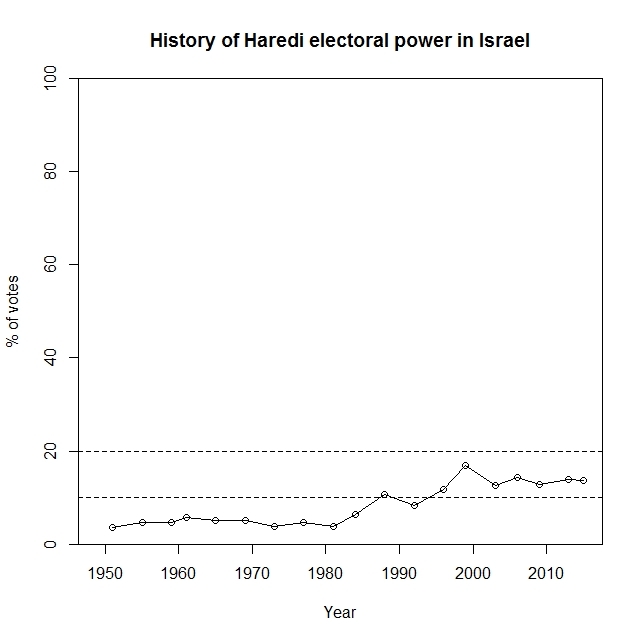 The chart below shows the proportion of votes received by Haredi parties in Israeli elections. Data: text file, Google spreadsheet. Progressive ideology generally asserts that there is a wide variety of elements of conceivable and feasible policy and technology that would significantly improve average quality of life. It may be further assumed that the pursuit of any of those elements or any combination of those elements can be expected to be fruitful. To some extent this assumption – what may be termed the “parallel progress assumption” – seems to be implicit in much of present-day progressive activism: the agenda is usually very eclectic and often somewhat vague on specifics. While this is partly a tactic that is aimed at maintaining wide appeal, there is also the implication that as long as general principles are agreed to, laying out a detailed workplan is not necessary since progress can be made on any of many items quite independently of each other. While I accept the progressive assumption (i.e., that progress is possible) it appears to me that the parallel progress assumption is incorrect. The object of our analysis is, not to provide a machine, or method of blind manipulation, which will furnish an infallible answer, but to provide ourselves with an organised and orderly method of thinking out particular problems; and, after we have reached a provisional conclusion by isolating the complicating factors one by one, we then have to go back on ourselves and allow, as well as we can, for the probable interactions of the factors amongst themselves. This is the nature of economic thinking. Any other way of applying our formal principles of thought (without which, however, we shall be lost in the wood) will lead us into error. It is a great fault of symbolic pseudo-mathematical methods of formalising a system of economic analysis, such as we shall set down in section vi of this chapter, that they expressly assume strict independence between the factors involved and lose all their cogency and authority if this hypothesis is disallowed; whereas, in ordinary discourse, where we are not blindly manipulating but know all the time what we are doing and what the words mean, we can keep “at the back of our heads” the necessary reserves and qualifications and the adjustments which we shall have to make later on, in a way in which we cannot keep complicated partial differentials “at the back” of several pages of algebra which assume that they all vanish. Too large a proportion of recent “mathematical” economics are mere concoctions, as imprecise as the initial assumptions they rest on, which allow the author to lose sight of the complexities and interdependencies of the real world in a maze of pretentious and unhelpful symbols. There is much truth in the above, I think, and it is truth that applies not only to “economic thinking” but to any kind of thinking that relies on formalization. Statistical analysis is plagued with this kind of problems. Keynes does lay too much stress on the matter of interaction between factors. The problem with formal methods is not particularly with neglecting various effects – it is that they simply are false in various ways (neglecting various effects is only one of the sources of falsehoods). Informal methods have the same problem, of course – and in addition have problems associated with informality. 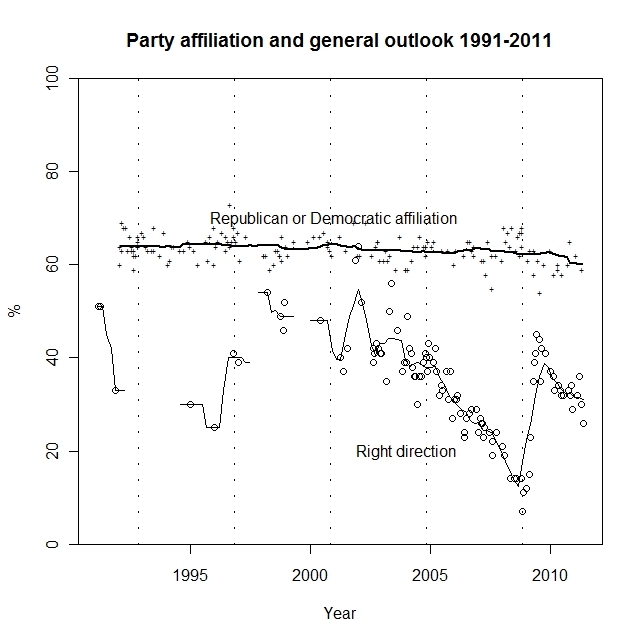 The proportions of Americans who are politically affiliated with one of the two major parties has been very stable over the last 20 years, at about 60% with a slight downward trend (+ marks and thick trend line in the chart below). Over the same period, the general outlook of the public has fluctuated wildly, with those who say the country is “going in the right direction” reaching over 50% at one point and falling 5 years later to 20% (circles and thin trend line). The public mood seems to be optimistic immediately following presidential elections (vertical dashed lines), and pessimistic immediately before them. Data source: New York Times/CBS poll, April 15-20, 2011. Since cities were founded and survive for no other reason than for the benefit of their inhabitants, which is based principally in preserving the common good, this cannot be restricted to one particular person or individual except at the expense of all the others. So what, I ask you, could be more pernicious or contrary to the essence of a city than for one part of it to be, quite unjustly and for no reason, excluded from all or part of the public benefits and consequently made to suffer greater disadvantages and burdens more than the other? [A]lthough it [the Venetian government] has a different name from the one we want to use, because it is called a government of nobles and ours will be called a popular government, it is not for this reason of a different type, since it is simply a government in which everybody who is qualified for office participates, making no distinction either for wealth or for family, as happens when the ottimati rule, but all are equally admitted to everything, and they are very numerous – perhaps more so than in ours. And if the plebs don’t participate, the don’t in ours either, since infinite numbers of workers, newcomers to the city and others, do not belong to our Council. And although it is more difficult in Venice for the ineligible to be qualified for office than with us, this is not because the type of government is different, but because within the same type they have different institutions. […] So if we were to call our citizens gentlemen and reserved this title for those who were qualified for office, you would find that the government of Venice is as ‘popular’ as ours and that ours is no less a government of optimates than theirs. Elections are first and foremost a mechanism for eliminating non-elite competitors for power – their role as an inter-elite arbitration mechanism is merely a derivative of their primary function. The filtering function is most severe in first-past-the-post systems, where there are often just two credible competitors, and rarely more than 3. Within the Tullock contest model, the entry barrier for minor parties can be calculated. The Tullock contest model specifies the chance of party k winning power as pk = xk [ tk ] [ x1 / t1 + … + xn / tn ], where xi is the amount of resources spent by party i, and ti is the (in)effectiveness of the party’s campaign efforts. Uk = pk G – xk [ fk ] = xk [ tk ] [ x1 / t1 + … + xn / tn ] G – xk [ fk ]. The model assumes that parties spend the amount that maximizes their expected returns. Under the model assumptions there will always be at least two parties with non-zero expenditures, since a party that finds itself without a spending opponent reduces its spending, until the derivative of the expected return for a competitor becomes positive at 0.
d Uk [ d zk ] = G ( (Z – zk) [ Z2 ] – rk ). such that zi > 0, i = 1, …, n.
where R = r1 + … + rn. zk = Z (1 – rk Z). rk > (R – rk) [ n – 2 ]. r(n) ≥ (r(1) + … + r(n – 1)) [ n – 2 ]. In particular, this implies that any party which has r > r(1) + r(2) will have negative benefit from engaging in an election campaign.